So far our Serie A performances have been severely lacking in quality, and the scorelines show it. Tonight, the players stepped it up a couple of notches, but I don’t know if it would be considered quality play necessarily. However, with a lot of heart and a little luck, we got the 3 points. And at least until everyone else plays tomorrow, that bumps us up to the top half of the table. You can’t put a price on that. This game started with more energy, and I got my hopes up. But Cesena came out very physical, and I worried how many more injuries we might have to endure. As if to distract my worrying, Emanuelson took a short free kick to Seedorf in the 5th minute, who, in an apparent attempt to cross it, scored a goal! 1-0 Milan. But the game was wide open on both ends. Commotto had an impressive backheel shot in the 9th minute that Abbiati easily managed. Both keepers were tested, but Ravaglia had the tougher saves on the night. Milan took 10 shots, 4 on goal, to Cesena’s 7 shots, with 3 on goal. Our shots came primarily from Seedorf, Emanuelson, Cassano, El Shaarawy, and even Yepes. So it’s nice to know we have people to step up when most of our normal goalscoreres are injured. And even better to finally keep a clean sheet. Another theme for the night were the ref calls. Milan were called for at least 8 offside calls, most if not all of which were on Cassano. And most if not all of which were not actually offside, with the benefit of the replay in HD. However when it came to calling penalties, the ref was not so quick to make the call, choosing to ignore instead at least one penalty for each team. At least that was fair. He also did not seem to know how to call a handball, but they weren't really blatant, I suppose a lot of refs would have said play on. But where Milan are going to really need to watch it are on their yellow cards. They racked up three more today: Taiwo got one in the 34th, and was incredibly lucky not to see another in the 45th, again on a dangerous challenge on Candreva. Yepes earned his for a silly tackle just outside of the box in the 50th, and has his team’s wall to thank that the ensuing free kick was not converted. 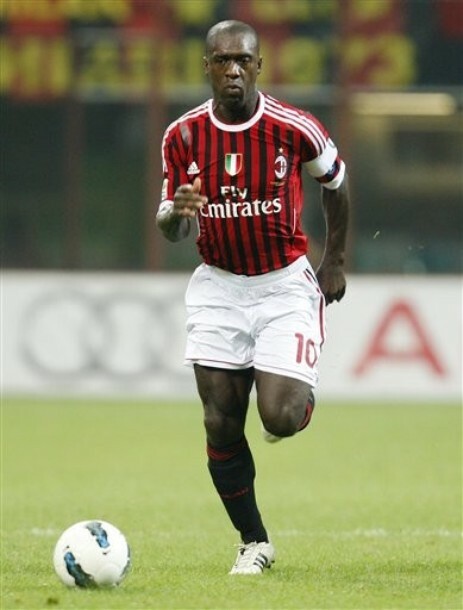 Seedorf just seemed tired when he got his for a dumb foul in the 65th. But whatever the reason, we can’t afford to keep accumulating them. With 11 first team players out injured now, care must be taken to avoid injury. Unfortunately, we may have broken Taiwo again in this match. He took a knock in the 19th to his left leg that had him grabbing the leg in pain, but he played on. Then Allegri subbed him off in the 51st for Zambrotta, whether that was for his dangerous play, the knock, another injury, or what I am not sure. Either way, I hope I don’t wake up tomorrow to more injury news. Someone who took a licking and kept on ticking like the Energizer bunny was Cassano. How many times throughout the game was he double teamed? (triple teamed, if you count the AR?) For example, in the 30th, he actually had 3 defenders on him and still managed to win the corner. He may not have managed to get on the board, but he did his damnedest the entire time, until he was finally subbed off in the 82nd for one Super Pippo. Hmmm... Cassano being fouled in the box... Penalty? Apparently not. Speaking of Super Pippo, he gave me quite the scare in the 72nd by disappearing from the bench and going into the tunnel. (I think he just forgot his mojo in the locker room.) I was getting ready to plot a slow and painful torture session for Allegri when all of a sudden he was on the sidelines ready to come in for Cassano 10 minutes later. There was a banner at the half that translated reads “You pray to your God while I pray to mine” with pics of Pippo as said deity. I was wondering where I left that thing. Even if the crowd was tragically too small, those that were there cheered him the loudest on the night. Which is how you are supposed to welcome a god, right? Thiago Silva was solid, particularly considering he was playing for Nesta and partnered with the unpredictable Yepes. He had one spectacular tackle in particular that was absolutely pristine in the 68th. Also from the defense, Abate was a beast as usual. Only this time he broke out some mad offensive skills, too. Like the beautiful cross he put in the box for Cassano in the 37th. Yepes and Zambrotta did well enough, we will just need to do better in the back to handle a scorer who is more in form than Adrian Mutu, whose attempts to trouble us were handled okay. In fact, Mutu was a far bigger threat physically for the entire game. It’s amazing he didn’t see yellow, even if teammate Guana did in the 20th. Ummm... Mutu? Don't break our Silva. Thank you. Speaking of Mutu’s teammates, former Juve player Candreva was problematic for the entire first half physically and with creating chances. Ghezzal may have replaced Martinez, but he took over the troublemaker role for Candreva, at least on offense. While Cesena may be considered a bottom tier team, currently sitting smack at the bottom in 20th, I will be surprised if they don’t claw their way out and up the table this season with the quality of the reinforcements they have made. Speaking of reinforcements, Aquilani came in for El Shaarawy in the 66th. He didn’t do a lot to impress, but he works hard every time he gets out there, and even when he doesn’t make plays that get him on the score or stat sheets, he does a lot to create space and help create opportunities. Whereas El Shaarawy did quite well for such a young player, giving Ravaglia his best save on the night while still chewing gum like the teenager he is. He is not yet a force to be reckoned with but is starting to prove he can hang with the big boys and even be dangerous at times. Although his acting to try to earn a penalty in the 38th needs definite improvement. He should definitely hook up with Inzaghi on this, as Pippo’s theatrics are legendary, he really knows his stuff. But I’ve saved the best for last. Not that we played an amazing game, but for me, the joint man of the match had to be Nocerino. That guy was a beast. He was everywhere! making crosses from short corners, defending from deep, then running forward to help on offense. He may seriously be the most underrated new signing of this season. And he’s tough, too. And pretty fast. And he was caution free for this match, too. I say we keep him. Someone else with some pace and my other man of the match was Urby Emanuelson. He was not joking when he said that he likes to play more offensively and less at left back. After a strong performance as a sub midweek, he earned the start today ahead of Aquilani. The kid is all heart, if not near equal parts talent. He creates scoring chances, he not afraid to take scoring chances, and works and runs hard for 90 minutes.He is one of many today who stepped it up and showed us the value of 3 points. Well the game may have been on the pitch, but the show was in the stands. The cameras kept panning to all of the currently injured and also former Milan players there. There was Maldini with Oddo, Ambrosini with Bonera, Ibrahimovic with Kevin Prince Boateng, Robinho with his son... it was like a red and black carpet event. But the highlight for me was at the half, when some young boy was seemingly getting an autograph from the esteemed Galliani. Then I thought… wait, we’re winning, we’re playing better, but we have lots of injuries. Did Galliani just sign that kid? Never underestimate the value of 3 points.